Call a member services representative at (330) 334-1023 for a no-obligation debt consultation. You could start next month with more money in your pocket. You could also save thousands of dollars in interest payments over the next several years. MedFed is offers three options to help you eliminate your debts faster with one low monthly payment. Because we are a not-for-profit credit union, we exist to serve our Members (you! ), we want to get you the best solution to help you pay down your debt as fast as your budget allows. with our experts to find the best option for you. You'll pay 0% interest for six months with No Balance Transfer Fee, NO Annual Fee and NO Cash Advance Fees. Learn more about the MedFed Visa Card or Apply Now. Use the equity in your home with a MedFed Home Equity Line of Credit. Money borrowed through a Medina County Federal Credit Union Home Equity Line of Credit can be used for any purpose, including paying off high-rate debt. With HELOC rates as low as the Wall St. Journal Prime Rate, you may be able to save a lot in interest payments after consolidating! Learn more about HELOCs or Apply Now. 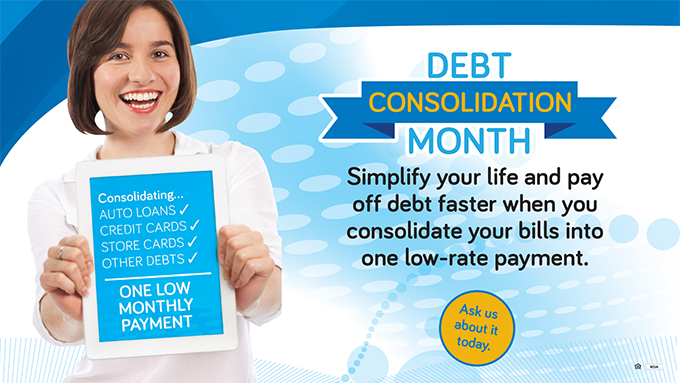 Consolidate to a low-rate MedFed Bill Consolidation Loan. A personal Bill Consolidation Loan allows you to pay off all of your bills and debt and replace them with a single monthly payment. Interest rates will vary based on your credit history. Apply online, by phone or stop in to talk with us. Learn more about Personal Debt Consolidation Loans or Apply Now. Ask one of our Bill Consolidation Experts how much you could save. 2. Print a Credit Application [PDF] and return it to us via fax or in person. 4. Call a member services representative at(330) 334-1023. Refinance your current mortgage and you could get a lower rate with low closing costs and the service you expect from your credit union. You might be able to reduce your monthly payment, lower your interest rate and pay off your mortgage faster. *APR= Annual Percentage Rate. Rates subject to change without notice. Approval for a MCFCU Home Equity Line of Credit is subject to meeting established credit criteria. Must be an existing Member or become a Member of the Credit Union to obtain a loan. Certain terms and conditions apply. Credit is Subject to approval. Consult a tax advisor regarding the deductibility of interest. MCFCU products, services, terms and prices are subject to change. Your APR may be higher and will be based on the current Wall Street Journal Prime Rate, your credit qualifications, the amount of the line, loan-to-value, and property type. APRs currently range from Wall Street Journal Prime Rate, to Wall Street Journal Prime Rate plus 1.00% for a Home Equity Line of Credit. Annual Fee: There is no annual fee. Account Opening Fees: There are no fees to open a Home Equity Line of Credit. Early Termination Fees: There is no early termination fee. Property Insurance: You are required to carry property insurance on the property that secures your account. Flood insurance may be required. Your payments on this account do not include taxes or insurance. Appraisal Fees: If applicable a $250 appraisal fee may apply. Credit is subject to approval. Rates, terms and conditions are subject to change at any time based on market conditions or other business factors. APRs may differ based on credit scores. Call or stop in to obtain product information and current rates. Payment example is based on $25,000 variable-rate balance at current variable APR of 3.25% (assumes one initial draw of $25,000). Minimum monthly payment of 1% or $100 whichever is greater are $250. Total number of payments – 180, with a maximum 10 year draw period. Highest payment possible at maximum interest rate of 18% is $250. APR is variable.